Please view our lovely collection of luxury glass sinks designed for the very best design led bathrooms. 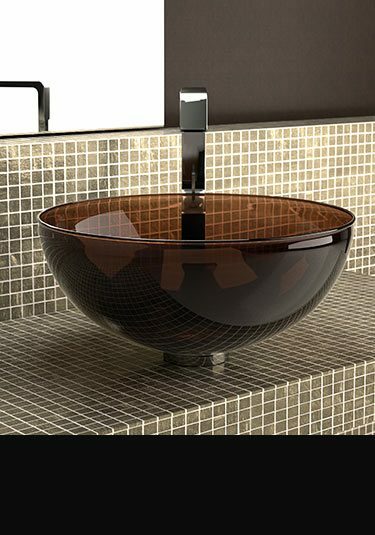 Within our glass bathroom basin range we offer the very latest designs from Italy in lots of glass colour finishes. We can supply glass wash bowls in clear and frosted glass plus basins in the coloured glass of white, red, black, brown, silver and gold. We also have glass designer sinks in many shapes and sizes including round, oval, rectangular and square. Beautiful glass wash bowls supplied in white, red and black glass finishes. 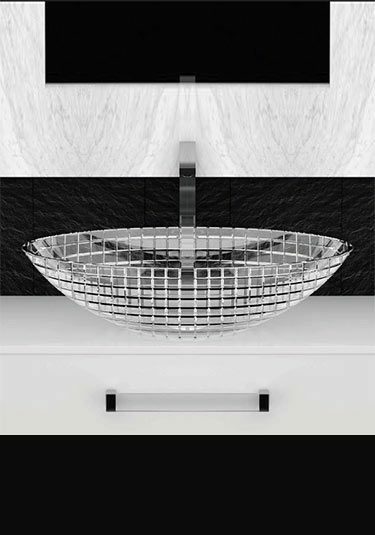 These luxury basins are the latest in contemporary designs and ideal for designer bathroom themes. 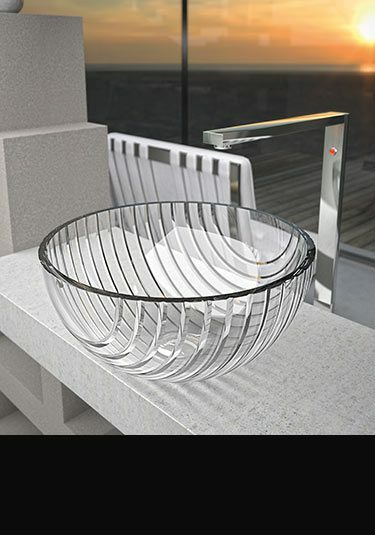 Beautiful sleek glass wash bowls supplied in white, red, black and other coloured glass finishes. These luxury glass basins are the latest in contemporary styling and ideal for designer led and luxury bathrooms. 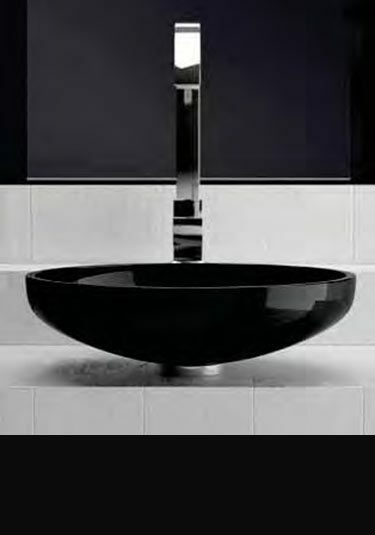 This jet black glass basin is beautiful Italian styling and an ideal addition to luxury bathroom design. 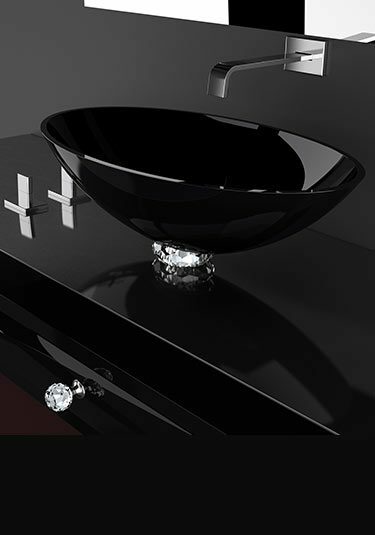 Each black glass sink is oval in shape and includes the lovely crystal glass mounting collar. This luxury glass wash basin is ideal for high quality bathrooms. 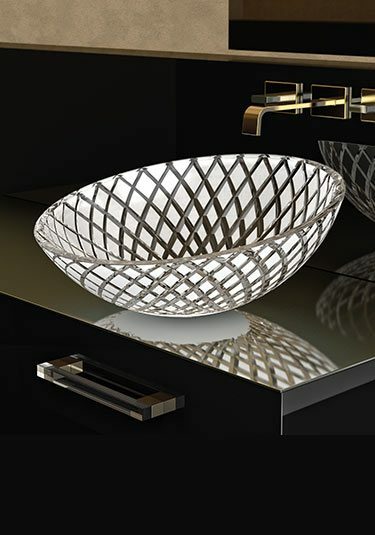 Each designer basin has the unique crystal cut design cut within the glass. A beautiful Italian design. A stylish round counter top designer basin in a satin frosted glass finish. 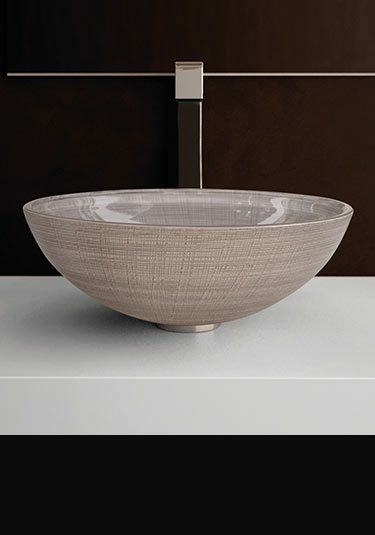 This glass wash bowl is Italian designed and a contemporary bathroom style choice. A stunning contemporary glass wash basin in the latest Italian bathroom styling. This luxury sink makes an ideal as a design feature within high quality and exclusive bathrooms. This stylish oval glass sink has a diamond satin frosting, etched into the clear glass. 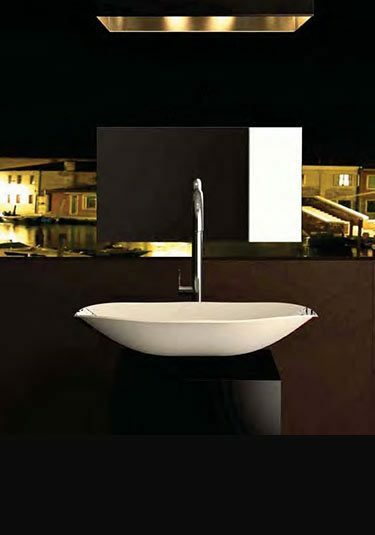 An Italian styled designer sink which is a designer addition to luxury bathroom design. A beautiful round glass wash bowl in a rich chocolate brown tinted glass. This designer sink is a luxury addition to exclusive bathroom design. Latest Italian styling. 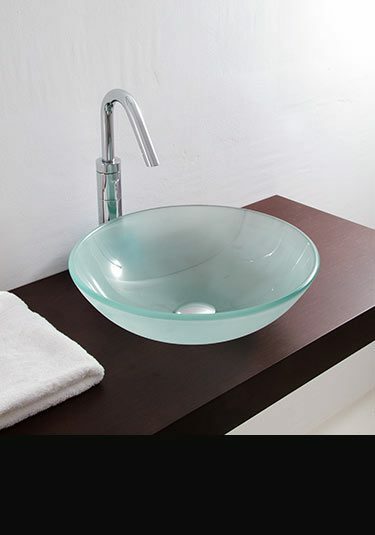 Contemporary styled rectangular glass basin that is beautifully low slung in design. Available in 2 colour finishes and European made. Designer basin supplied in crystal cut glass in oval and round designs. 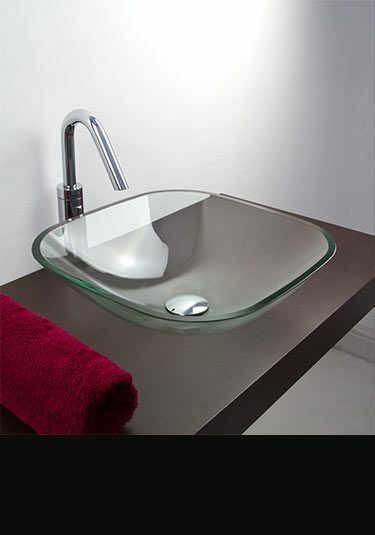 This clear glass sink is luxury Italian styled and a makes a lovely design feature within a high quality bathroom. 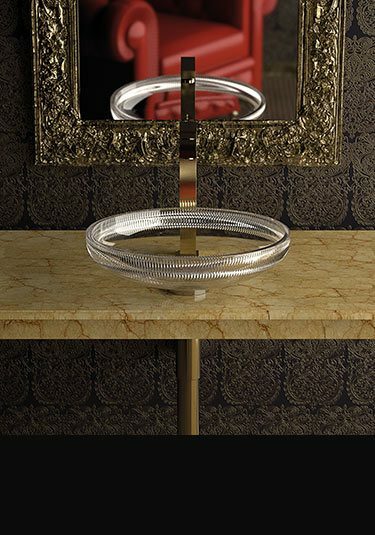 A luxury counter top glass basin with a brushed gold or platinum outer. Lovely contemporary styling and a feature basin for exclusive bathroom design. A lovely quality cut glass wash basin in the latest European design. This luxury designer sink is a beautiful design feature within an exclusive bathroom style. 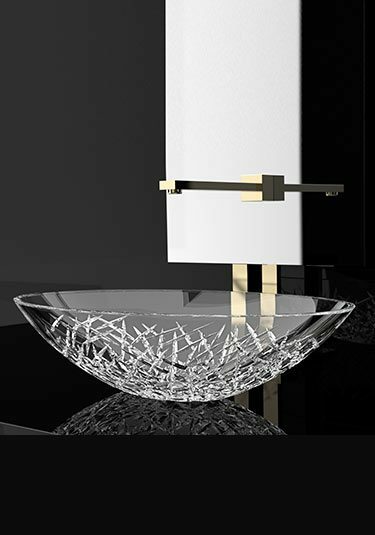 A stunning square glass sink available in gold or silver leaf finishes. 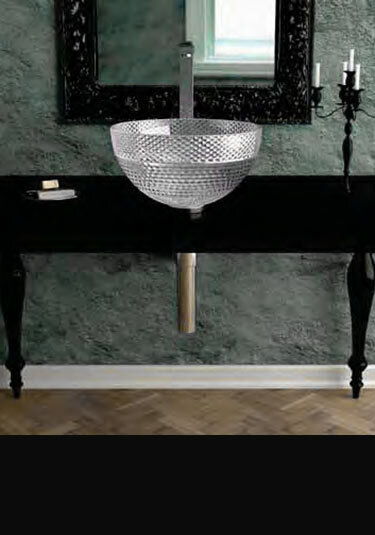 Top Italian design for high quality and luxury bathrooms..
Clear glass wash basin with a beautiful crystal cut styling. Ideal as a feature basin in an exclusive bathroom design. Beautiful Italian styling. 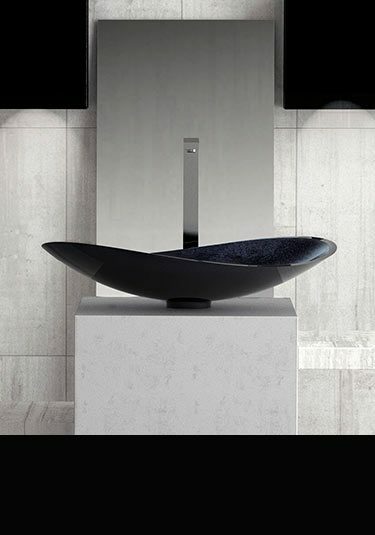 A luxury glass composite basin in a soft twisted petal design. Ideal for designer bathroom styling, this designer sink is available in blue, black and white. A beautiful feature basin. Unique Italian clear glass wash basin finished with a lovely white or gold frosted design. A beautiful feature basin for luxury and high end bathrooms. This square sink is made in transparent glass. This designer bathroom bink is an ideal design choice for counter top and contemporary bathroom styling. A stunning freestanding glass basin in a beautiful flower design. 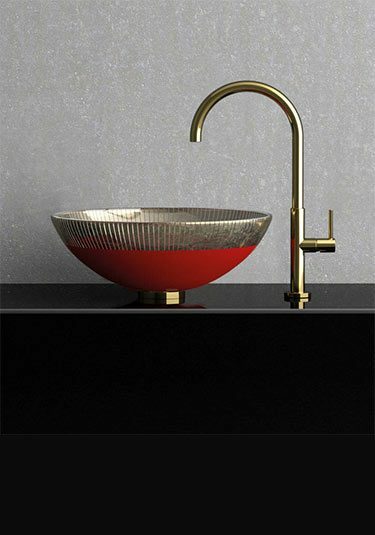 This luxury designer sink is available in a vivid red, white, black and gold leaf glass finish. Definitly a central design feature in luxury bathroom design. A luxury glass basin with a lovely clear crystal glass rim design. Styled for exclusive bathrooms, this clear designer sink is an ideal feature within an exclusive bathroom. An oval clear glass basin that is designed in Italy. This glass designer sink is a modern contemporary design choice and is ideal for counter top situations. A wall mounting bracket for glass and ceramic wash bowls. 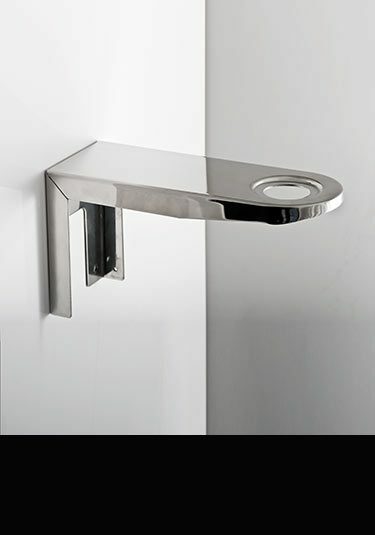 This wall hung basin bracket has also got a tap hole for mounting single mixer taps. LIVINGHOUSE offers the best selection of glass basins which give bathrooms true luxury that high quality bathrooms deserve. 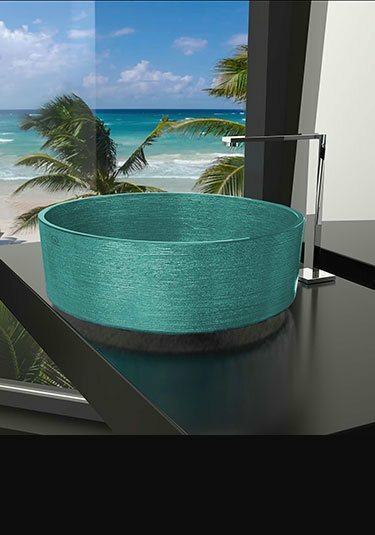 Not just your average frosted glass wash bowl but exclusive finishes make these designer offerings special. So if you are looking for the ultimate design feature for your bathroom, one of these designer basins could be the answer. 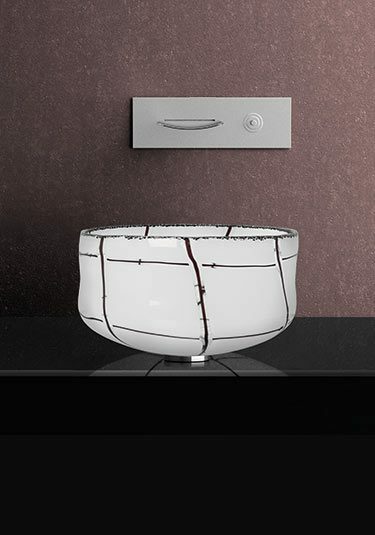 These luxury basins are available in all glass shapes from round bowl shapes, oval, square or oblong, shallow cylinder and even a 'poppy-shaped' red sink. 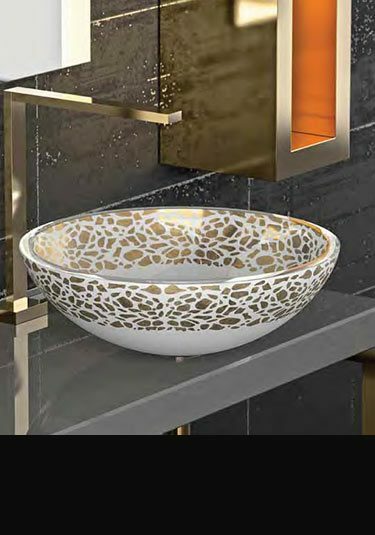 Superb designer finishes ensure that basins from LIVINGHOUSE are the 'crème de la crème' and include clear and frosted glass, gold, bronze and silver leaf, glass mosaics basins the superbly elegant cut and crystal glass sinks. 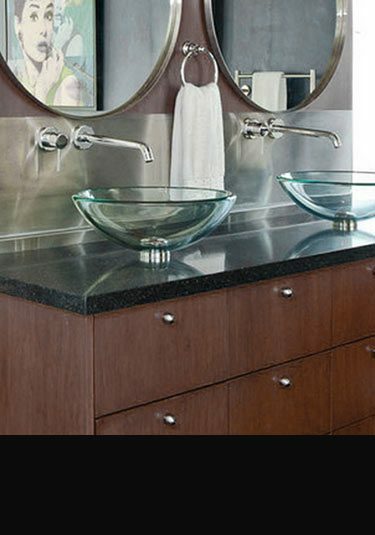 The latest beautiful basins are mainly available for counter top installation. 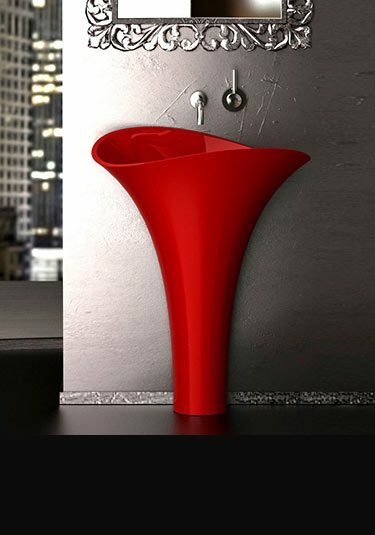 However there is a stand-out freestanding Poppy sink available in glossy poppy-red, white, matt black and gold leaf which could make a dramatic feature in any high end bathroom. Not surprisingly these contemporary Italian designs from LIVINGHOUSE come with a 3-4 week wait as they are made to order. But these exclusive glass bathroom sink beauties are well worth the wait.